Okurrrrrrr! Khloé Kardashian is not shy about sharing photos of her doted-upon four-month-old daughter True but her latest effort might just be the most cheek-filled yet! Khloé uploaded the photo of an absolutely elated baby True, tucked into the front seat of a toy Bentley, a giant frocked-up teddy riding shotgun. 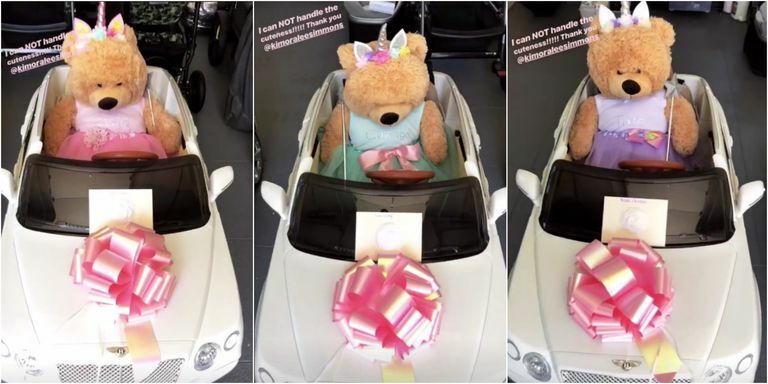 The toy car, a gift from Khloé’s friend former model and designer Kimora Lee Simmons, is finished with a pink rosette and gift card. True’s wearing a very fetching headband, possibly a homage to (another “aunty”) Chrissy Teigen’s Headband of the Day, and her teddy is also sporting a headband, in this case, a unicorn one. But wait, there’s three of them! True’s not the only Kardashian baby to receive a Bentley from “Auntie Kimora”. There were three gift-wrapped baby Bentley’s dispatched to not only True, but also Kim Kardashian’s baby Chicago and Stormi, Kylie Jenner’s tiny girl. 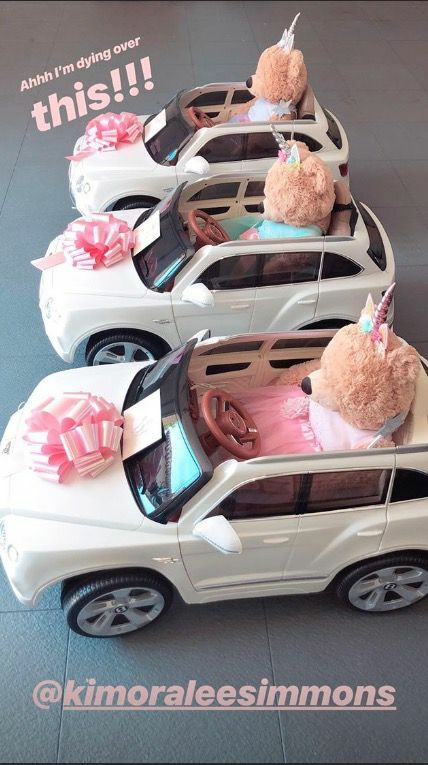 The tutu-wearing unicorn teddies were also part of Kimora’s gift. Predictably someone in the comments of Khloé’s Instagram was not happy about True’s sick ride AT ALL. They accused her of “embedding materialism in [True’s] brain”. Khloe wasn’t having a bar of it. The Kardashian-Jenners already had a special relationship with Bentley. Kylie was photographed behind the wheel of one of her many full-sized Bentley cars, shortly after Stormi’s birth. Perhaps Kimora has a similar ambassador role, too?